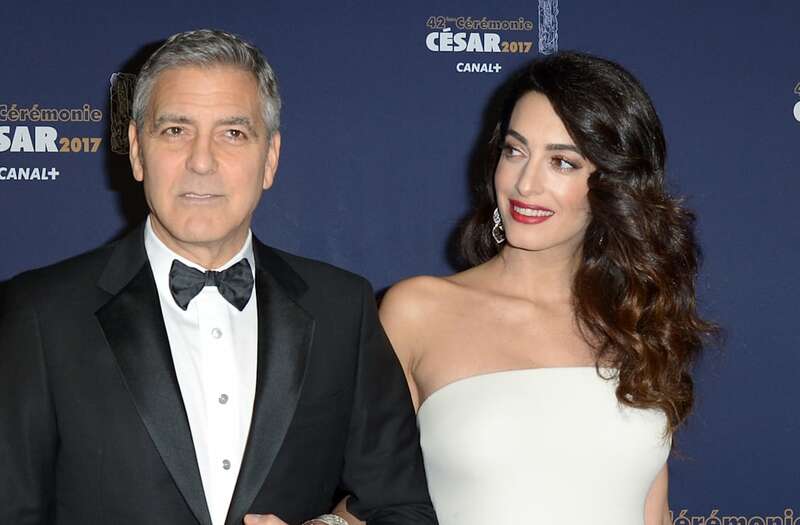 Amal Clooney's baby bump makes official debut at the 2017 Cesar Awards -- check out the glam pics! Amal Clooney's pregnancy bump just made its official debut -- and we're obsessed! Amal, 39, joined her husband, 55, at the Cesar Awards in Paris on Friday. While George is quite a looker on the red carpet, all eyes were on his stunning human rights lawyer wife. The expectant mother of twins wore a white strapless gown with ombre white, gray and black plumage all along the skirt. She completed the glamorous look with a bold red lip and Old Hollywood-inspired curls. Her actor husband, who was one of the most sought after bachelors in Hollywood before they got hitched, looked equally as stunning in a sleek tuxedo. The two lovebirds looked totally happy and in love on the red carpet, and photos of them inside the Parisian venue showed more adorable PDA. They're photographed holding hands in one snapshot, while Amal went in for a hug in another. George and Amal revealed a couple of weeks ago that they're expecting twins, a boy and a girl, in June. Though they still have a couple of months before the kiddos come, they've already made big changes in preparation for their arrivals. Amal has already chosen a London hospital where she will deliver their bundles of joy, and has also one New York City just in case she gives birth while traveling. They've also picked out a room in their sprawling, newly-renovated estate just outside of London that will serve as the nursery. And in perhaps the biggest change they've made, George revealed in a recent interview they're being more cautious and have stopped traveling to dangerous locations. "We decided to be much more responsible, to avoid the danger. I will not go to South Sudan anymore and or the Congo [and] Amal will no longer go to Iraq and she will avoid places where she knows she is not welcome," the Hollywood icon explained. "Before, I did not care. I would even say that there was a pretty exciting side to going where no reporter had ever been." Amal's line of work is clearly not your average 9-5 job. In fact, the attorney has even recently taken on ISIS on behalf of her client, Nadia Murad, a human trafficking survivor. The two got married in a gorgeous Italian wedding in mid-2014 surrounded by their closest friends and family, including one of George's best pals, Matt Damon. Pregnant Amal Clooney stuns in red: See the glamorous pic!